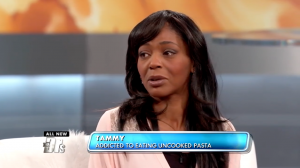 Tammy has been secretly addicted to eating uncooked pasta for the past 30 years. Prior to her visit to The Doctors she consumed a box per day to satisfy her intense cravings. Crunching on raw macaroni has severely damaged her teeth and led to diminished self-confidence and self-esteem. Despite all of the negative effects this addiction has had on her life, Tammy has felt powerless to overcome her destructive habit. After coming on The Doctors and speaking with a clinical psychologist, Tammy was able to uncover the psychological reason she turned to pasta for comfort and soothing. With help from The Doctors, she now feels empowered and ready to overcome her addiction. In addition to offering Tammy a year of psychological therapy and nutritional counseling, The Doctors provided her with a complimentary smile makeover performed by Las Vegas cosmetic dentist Joseph Willardsen, DDS. With this generous assistance Tammy hopes to achieve both a beautiful new life and smile! Watch Tammy on The Doctors episode below and see her tears of joy as Dr. Willardsen presents his surprise. Stay tuned for a future episode featuring Tammy’s results!